Imperial War Museum Duxford 2016. I have heard they are quite expensive to operate. I'm surprised one would do air shows, if that is true. 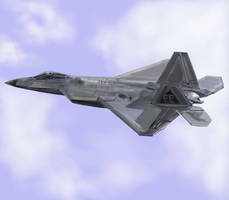 On the contrary, as one of the most modern and sophisticated combat aircraft in the USAF's arsenal, the Raptor's presence on the airshow circuit will be seen by those in command as significantly important, if not vital to the future of their operation. The role that Airshow's play in the world of military aviation is far more than simply for the frivolous entertainment of the masses. Airshows are a way for the armed forces to engage with the public and promote the work that they do. It's fair to say, that it is likely that a good many who serve air arms around the globe in any capacity, will have gained their passion for aviation through public engagement like this. Whether that be those who fly, or simply work on the aircraft, it is all to often a love of aviation that put them where they are and airshows work to encourage that enthusiasm and passion. In short, the pilots of today were very likely the airshow audiences of the past, so an aircraft like the Raptor is an incredibly powerful tool in that regard because it can create memories and stir passion in people. Not to mention the fact that people like to know where their hard earned tax money is going and airshows are a way to highlight this along with promoting national pride. Your laser-guided focus has scored a hit with this extreme capture! As always, first class work Sir. wonderful shot of it Dan!